I wanted to make some crocheted flowers for a scarf I'm working on (yes, another) so was having a play and came up with the sweetest little coiled roses. Aren't they pretty? So easy peasy lemon squeezy too. Want to see how I made them? Leaving a tail of approximately 6 inches, chain 21 (20 and 1 for turning). Row 1 : Starting in the second chain from the hook, work 2dc in each chain to the end of the row (40). Row 2 : Work 2tr in each stitch to the end of the row (80). Tease your work into the desired rose shape with the beginning at the centre (you'll find it should want to naturally coil because you're making it top heavy, so to speak). Now poke your starting tail through the middle and tug quite firmly. That, my dear friends, is it! The smaller pink rose was made in a similar way but with a starting chain of 11 (10 and 1 for turning) and I worked 2htr in each stitch, rather than 2tr, in row 2. You could have fun playing around with the size of your finished rose by beginning with more or less chains, or using a different sized hook, (I used 4mm for these). By the way, I used the 'medium fat bottomed leaf pattern' from here for my leaves. Why are you still here? Go grab your hook and pimp some woollies ..! So love your writing style. Fun,straight and inspiring. Love ya! I am going to try this tonight. Sleeping in the lounge tonight while our VILE VILE bedroom is finally being plastered so shall enjoy a little sofa bed action......involving nout but crochet!!!!! Hope you are well beauty. I am...........well heavy. Hurting a bit when I walk. YIKES!! The flowers are ever so charming, and your crochet hook is the nicest I've ever seen. No doubt you have other hooks with different-coloured handles? So pretty and, yes, easy peasy, thanks so much for sharing - love your soft gentle colours too. Right, I'm off … …. 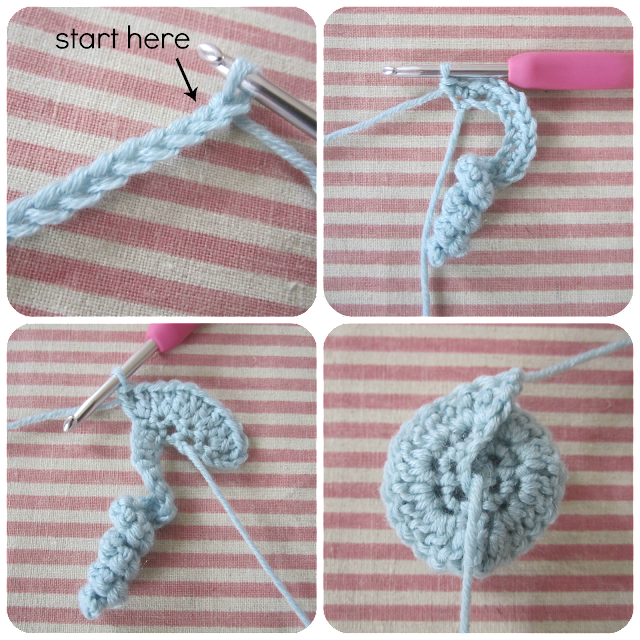 I can't believe how simple they are, thanks for sharing as I've never found a pattern but always liked them. I must add you to my sidebar so I don't miss your posts, can't believe not been here for so long as your blog is lovely. Clever you -they're perfect. I'm now desperately thinking about what I can put flowers on ! What cute little flowers you've made! These are adorable! I love making flowers and will do some of these today. Thanks for the pattern. I found your blog this morning and will come back daily! I make a ton of scarves and hats every year, also. They are easy and a portable project. Have a lovely day! 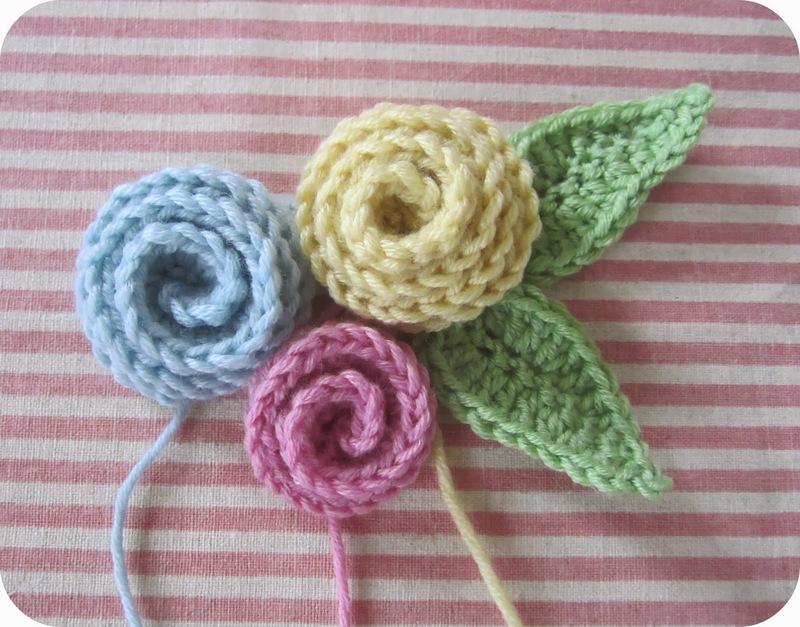 These are really pretty and different to most other crochet flowers I've seen before. Thanks for taking the time to share the pattern too! i definatley will grab a hook! the look beautiful! thanks for sharing! I'm in the US and am wondering if the stitches would be the same? If not, could you please give me the US equivalents? Thanks. LOVE these flowers! j'adore vos modèles de crochet!!! merci!